The TSA is expected to turn in another record-breaking year for the number of guns seized at airports. While the final tally has not been made, records show 2018 is well on its way to surpassing the 3,957 guns confiscated the year before. 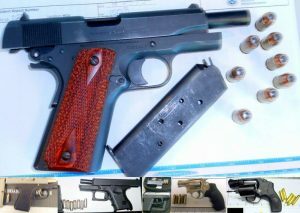 The number of guns seized at airports has increased every year since at least 2005, when 660 firearms were confiscated. In just one week in early December, the TSA reported 78 guns were confiscated, ranging from .40-caliber Glocks to 9mm semi-automatics. Of the 78 guns, 63 were loaded. The airports with the most guns confiscated last year were Atlanta with 245 and Dallas-Fort Worth with 211. The theories for why more guns are being confiscated ranges from a more diligent security to flyers taking bigger risks out of fear of terrorism. Posted: 12/28/18 at 2:37 AM under News Story.